Middle East historian says Palestinians must change the rules of resistance. It was a hot September day in Gaza and I was sitting in the office of a Hamas-affiliated newspaper talking with a senior Hamas intellectual. As the French news crew that had given me a ride from Jerusalem packed up their camera equipment, I took the opportunity to change the subject from the latest happenings in Gaza to a more fundamental question that had long bothered me. "Off the record, lets put aside whether or not Palestinians have the moral or legal right to use violence against civilians to resist the occupation. The fact is, it doesn't work," I said. Suicide bombings and other direct attacks on Israeli civilians, I argued, helped to keep the subject off the occupation and in so doing allowed Israel to build even more settlements while the media focused on the violence. His response both surprised me with its honesty and troubled me with its implications. "We know the violence doesn't work, but we don't know how to stop it," he said. More than two years into the al-Aqsa intifada, when the Fatah-controlled Palestinian Authority had demonstrated itself to be incapable either of effectively governing the small parts of the Occupied Territories under its control, or of resisting the ongoing occupation, Hamas was increasingly being seen as the most viable alternative force in Palestinian politics. Yet on the most basic questions confronting the movement and Palestinian leaders more broadly - how to force Israel to stop expanding the occupation and negotiate a peace agreement that would bring real independence - Hamas's best minds had no clue what to do except continue with a strategy that many in the leadership understood was not working. Hamas's lack of creativity should not have decisively shaped the broader context of Palestinian politics, as polls rarely showed its popularity exceeding 20 per cent. However, by 2002, with negotiations nowhere in sight, whole regions of cities such as Nablus and Jenin destroyed, and Israel sewing chaos across the West Bank and in so doing destroying the basic foundations of PA rule, Hamas's power was rising quickly. Aside from adding crudely made rockets to its arsenal the year before, Hamas was fresh out of ideas. There were not many viable alternative strategies to violence Hamas or any other Palestinian movement could choose from in 2002, or in the century leading up to it. Whether it was an Ottoman state turning a blind eye to early Jewish land purchases, landowners (often with few or no local ties) selling peasant-worked land to Zionists for a tidy sum, urban notables refusing to support democracy or better conditions for workers, or much of the Palestinian elite fleeing the country in the months before the British Mandate's end, in its crucial formative phase Palestinian society did not have a political and economic leadership that consistently put national considerations ahead of more narrow political, factional, economic or personal interests. Britain, which conquered Palestine in 1917, was mandated to support Zionist national goals while merely "safeguarding" the civil and religious rights of Palestine's indigenous inhabitants. Enabling the development of independent and strong Palestinian political institutions would have undercut the creation of a Jewish national home. And so, in good colonial fashion, Britain encouraged the more conservative and corrupt tendencies of Palestinian society, while systematically frustrating the emergence of a capable and democratically chosen nationalist leadership. When the inevitable civil war in Palestine erupted in 1948, the social, political and economic weaknesses within Palestinian society (most of its leadership had been exiled by 1939), coupled with the opposition to the establishment of an independent Palestine by the very Arab neighbours supposedly invading to support it, enabled a seemingly improbable Zionist/Israeli victory. There was little room for independent Palestinian political development after 1948, with Gaza and the West Bank under Egyptian and Jordanian rule, even after the creation of the PLO in 1964. Israel managed to frustrate the emergence of a PLO base that would threaten its control of the Occupied Territories after their conquest in 1967. However it could not prevent the development of the sophisticated civil society and social networks that enabled the early successes of the intifada, which erupted in late 1987. The intifada succeeded in good measure because of its mass social base and focus on largely non-violent protests such as commercial and tax strikes and blocking roads. However powerful the symbolic violence of stone throwing youths pitted against the 'Goliath' of the Israeli army, Israel's far superior military power and willingness to use indiscriminate force, coupled with the arrest and long-term imprisonment of tens of thousands of Palestinians, wore down Palestinian society, sapping the strength of the intifada by the time the Gulf war started in 1991. Neither the PLO's renunciation of terrorism in 1988 nor the emergence of Hamas earlier that year could change this dynamic. Yet Israel clearly took note of the threat posed by local Palestinian activism to its control over the Occupied Territories. The Oslo back channel was pursued in good measure to bypass Palestinian civil society and the locally rooted negotiators who led the Madrid peace talks in the wake of the Gulf war. The Palestinian Authority established in the wake of the Oslo accords was run largely by PLO officials from Tunis, who were not rooted in the Territories. Whatever their original intentions, their interests quickly morphed from securing a full Israeli withdrawal to maintaining their newfound political power, access to wealth and patronage through Israeli-sponsored monopolies, large-scale international aid, and various forms of corruption. Israel's leverage over the Oslo Palestinian elite helped ensure that the PA functioned as much as Israel's policeman in the Occupied Territories - controlling and when necessary repressing opposition to the ongoing occupation - as it did a partially sovereign government preparing the country for independence. The Palestinian legislative assembly and judiciary, both of which were more accountable to the citizens of the Territories, were intentionally marginalised. Being one of the few groups entirely outside the process, Hamas was well-positioned to offer an alternative strategy towards independence. Instead, in the same year that the PA was established, 1994, Hamas turned its focus towards the kind of spectacular violence that characterised the PLO a generation before. This strategy achieved little besides strengthening Israel's matrix of control over the Territories (most recently by providing the rationale for the construction of the Separation Wall, most of which has been built inside the West Bank). Aside from the moral and legal problems associated with such attacks - whether by rockets or suicide bombs - Hamas and other militant groups failed to understand that terrorism rarely succeeds unless the insurgency deploying it is already strong enough demographically, militarily and politically to defeat the occupier. This situation held true in Algeria, Vietnam, and even Lebanon, but it has never existed in Palestine. With the outbreak of the al-Aqsa intifada, Hamas's reliance on extreme violence - in its rhetoric as well as actions - overshadowed other forms of Palestinian resistance, giving Israel the necessary cover to deploy an even greater intensity of violence across the Territories. This dynamic generated a level of chaos that necessitated the coining of the term intafawda (fawda in Arabic means chaos or anarchy) to describe the chaos and anarchy that often characterised life during the al-Aqsa intifada. Both Hamas and Fatah engaged in kidnappings, torture and murder of opponents of all stripes, leaving little space for Palestinian civil society to shape a viable strategy of resistance against the occupation. Hamas's reliance on violence as its chief tactic of resistance provided Israel with the opportunity to use its victory in the 2006 legislative elections to split Palestinians geographically and politically. In the West Bank, where territorial conflict is now centered and settlement construction continues, Israel helped the more cooperative Fatah-led PA to maintain its power (although the Gaza war may now render the PA unsalvageable). Hamas was relegated to the prison of Gaza. By early 2007 the situation was so bad that Gazans suffered attacks by Israeli helicopter gunships and street battles between Hamas and Fatah on the same day. As Hamas and Fatah veered increasingly towards civil war, Hamas fulfilled precisely the function Israel hoped it would when it tolerated and even encouraged the movement's early development. Israel saw it as an alternative to the PLO that would weaken or split the Palestinian national movement politically and territorially; precisely what ultimately happened. By early 2008, Israel's siege had made matters so desperate that Gazans broke through the border wall between Gaza and Egypt in order to escape into neighbouring Sinai towns for a few days to buy food, medicine and other necessities in short supply because of the siege. Yet when a group of NGOs, joined by ordinary citizens, tried to build on the momentum at the southern border by staging a peaceful mass march to the Erez border in order, symbolically at least, to dismantle it, a line of armed Hamas policemen stopped the 5,000 strong marchers half a mile south of the crossing. Rather than seizing the opportunity to shift the struggle towards a terrain - mass civil disobedience backed by international law - on which Israel's footing would be far less sure, Hamas served Israel's interests by stopping the march. Later that afternoon, Hamas launched a rocket assault on Sderot, injuring a small Israeli girl, continuing a cycle of violence that ultimately led to the December-January war. Hamas's charter declares that "There is no solution to the Palestinian Question except by Jihad" (Article 13). Perhaps. But what kind? If "jihad is the path" (Article 8), is violence the only vehicle that can travel upon it? Martin Luther King engaged in holy war, as did Gandhi before him, and Bishop Tutu after. Palestinians too have waged more than one kind of jihad. In fact, for most of the last decade - indeed, throughout the 42 year occupation - just going about one's daily life and navigating the innumerable obstacles of the occupation, has for most Palestinians constituted a supreme act of non-violent resistance. There have also been literally thousands of non-violent protests staged by Palestinians across the Occupied Territories, the majority of them ignored by the media and repressed, often violently, by Israel. Successful non-violent movements, such as in the US, India or (for the most part) South Africa, succeeded because, in Gandhi's words, they sought "to convert, not to coerce, the wrong-doer". As Gandhi explained it, the goal of non-violence must be to obtain the cooperation of one's opponent to achieve a just end to a conflict, utilising means that reflect rather than degrade the justice of one's cause. At the same time, Gandhi also understood that no conversion of the occupier could occur without also transforming oppressive social and economic relations within one's society. As a socio-religious movement heavily involved in the provision of social welfare services, whose popularity has in good measure been tied to its anti-corruption and social justice rhetoric, Hamas was well positioned to follow this path. However, instead of learning from the experiences of the first intifada and successful activism in other countries, Hamas looked backwards, to a vision of revolutionary violence whose record of producing real freedom and development in developing societies has been checkered, at best. According to David Theo Goldberg, a South African scholar, the example of the defeat of apartheid in his country points to the importance of "de-normalising" the Israeli occupation - showing the world that its actions are not normal, and cannot be justified with claims of self-defence or security. 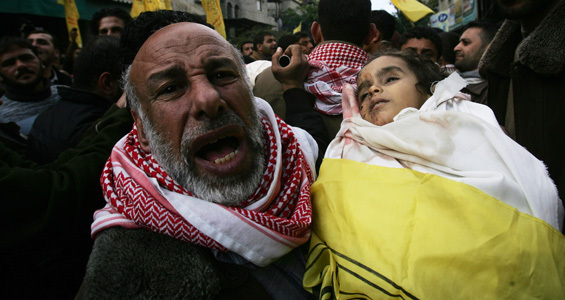 When during the past year Hamas leaders talked proudly of making "death an industry of the Palestinian people" and creating "human shields" composed of old people and children, or declared Jewish children everywhere to have become legitimate targets of murder (as did Hamas commander Mahmoud Zahar in a televised broadcast on January 5), the movement helped normalise the intensifying siege on Gaza, playing into deep-seated Western - and particularly American and Israeli - stereotypes of Muslim irrationality and brutality. Indeed, such statements have long made it easier for the media, and the public, to ignore or even justify similarly racist or bigoted statements by Israeli leaders. In this context, once the truce agreed to by Israel and Hamas in June 2008 broke down, the relaunching of Qassam rockets - even if they were in response to an Israeli provocation - normalised Israel's massive response in the eyes of its citizens, and a large majority of Americans as well. In this discourse, any 'normal' country would feel compelled to respond militarily when thousands of rockets are fired into its territory by an adversary who uses its own children as human shields while threatening to kill one's children the world over. An opportunity in Gaza's ashes? If there is a bright spot for Palestinians in the horrific violence of the last few weeks, it is that Israel's deployment of disproportionate and indiscriminate violence in Gaza has revealed the abnormality of the occupation for millions of people who previously had been unable to perceive it. This revelation offers Hamas, and the Palestinian leadership more broadly, the chance to change the larger terms of the debate over the future of Israel/Palestine. It could help move Palestinian society (and with it Israeli society, however reluctantly) away from the paradigm of two nationalist movements engaged in a competition over territory and towards a common future. This process can only begin with the conversion of Israelis and Palestinians to the idea of sharing sovereignty, territory and even identity in order to achieve the greatest good for the most members of the two societies. It is worth noting that the far left in Israel has long had such a bi-national programme. For its part, the PLO came close to it with its call for a "secular democratic state" in all of Mandate Palestine in 1969. However, such an idea has never had a chance of being considered seriously as long as terrorism has been identified as the central strategy for the realisation of Palestinian nationalism. When the two-state strategy epitomised by the Oslo peace process collapsed at the Camp David talks of July 2000, there was an opportunity for Palestinians again to change the terms of the debate. Hamas in particular could have offered an alternative discourse to Yasser Arafat's supposed 'No' to a generous Israeli final offer. But the movement had little new to offer. Indeed, at this crucial moment a leadership vacuum opened across Palestinian society, which Ariel Sharon, the then Likud leader, ever alert to an opportunity to throw the peace process further off balance, exploited with his infamous visit to the Temple Mount. Sharon clearly hoped to provoke a violent Palestinian response that would shift attention away from the reality that Israel had not in fact offered Palestinians a viable deal at Camp David. His highly symbolic but politically meaningless visit became the spark for the al-Aqsa intifada. What few have considered as the new intifada unfolded was whether Palestinians should have responded to Sharon's visit with violent protests. There were certainly other options. Mosque officials could have offered him tea, and in front of the media's glare, asked him politely but firmly to explain how he expected Jews and Palestinians to live together peacefully when the occupation had intensified during Oslo. It is impossible to know for sure what Sharon would have answered, but there is a good chance that this would have thrown him off balance, exposing the abnormality of the peace process-as-occupation for all to see. 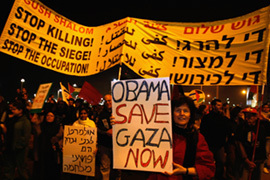 Instead, Palestinians played the part assigned to them, and a so far eight year long intifada erupted. As no less a supporter of Palestinian rights than Norman Finkelstein argues, it has left "Palestinians ... [with] little to show for the violent resistance ... It is at least arguable that the balance-sheet would have been better had Palestinians en masse adopted non-violent civil resistance". Israel offered Hamas another opportunity to change the terms of the conflict when in late November, 2007, Ehud Olmert, the Israeli prime minister, warned Israelis that their country "risked being compared to apartheid-era South Africa if it failed to agree an independent state for the Palestinians". With that remark Olmert was revealing to the world what Haaretz commentator Bradley Burston has called the "ultimate doomsday weapon," - one which senior Israeli commanders "could only pray that Palestinians would never take out and use". As Burston pointed out, when the opportunity for Palestinians en masse to just "get up and walk" arose with the march to Erez less than two months after Olmert made his remarks, Hamas forced Palestinians to keep their most powerful weapon under lock and key at the moment it could have been used to its greatest effect. 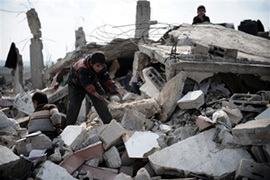 A year later, much of Gaza has been turned to rubble, at least 1,300 more Gazans are dead, joined by at least 13 Israelis. The futility of violence as a strategy to achieve either society's core objectives has never been so clearly on display, as has the bankruptcy of a two-state solution that was likely miscarried at the very inception of the peace process a decade and a half ago. It is not likely that Israel will emerge from this tragedy ready to offer Palestinians a territorially viable Palestinian state. The newly inaugurated Obama administration could force it to do so, garnering near universal acclaim for salvaging the two-state solution in the process. However, it seems more likely that the two-state solution will remain as illusive in the near future as it has in the past. In such a situation Palestinians face a choice: continue to play by Israel's rules and see their dreams of independence disappear for at least another generation, or change the rules by demanding the same rights enjoyed by Israelis over the entirety of historic Palestine. By taking heed of Olmert's warning, Palestinians can begin the journey towards a future in which Jews and Palestinians can share the land of historical Palestine/Eretz Yisrael for the benefit of both peoples, rather than at the expense of the other. The road will no doubt be long and painful; but even as the fog of the latest war dissipates it is hard to imagine another path emerging that could lead to an independent, peaceful future for Palestine, or Israel.